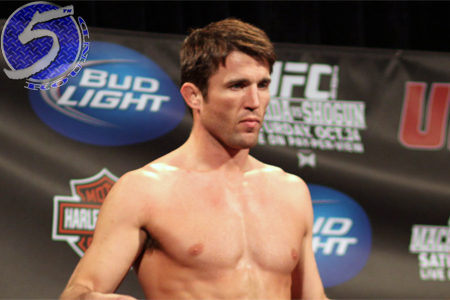 Chael Sonnen (Pictured) was hoping his game inside the Octagon and outlandish comments outside of it would score him a rematch with UFC middleweight king Anderson Silva. On Friday, Fighters Only announced the sport’s most articulate trash talker will host their “2011 World MMA Awards” on November 30th. Molly Querim will return as the show’s co-host. Furthermore, this year’s ceremony will be broadcast in primetime slots across North America by the FOX Sports Network. Replays will be made available on FUEL TV and FSN on dates to be determined. The Pearl Theatre at the Palms Casino Resort, Las Vegas, Nevada will host the fancy black-tie reception. “I say it every year that we want to make the awards show bigger and better and every year we have done just that,” Fighters Only CEO Rob Hewitt said. “However, none of it would be possible with out the support of the MMA industry, the fans, our sponsors and TV and venue partners who all believe as much as we do in this project. Fans can still cast their votes on a wide range of mixed martial arts categories. Polls will close on November 25th. Tickets for the “2011 World MMA Awards” go on sale today on Ticketmaster beginning at 3PM ET/12PM PT. Seats for the shindig range between $55 to $99.